"While trying to save their childhood orphanage, Moe, Larry, and Curly inadvertently stumble into a murder plot and wind up starring in a reality TV show." If you have ever been a fan of the original Three Stooges, this modern take on them is about the best you could ask for. While keeping in the spirit of the olden slapstick eye-poking, head-whacking, foot stomping shenanigans of the originals with probably a few moments of "the modern cinema" slipping in there as well, it easily entertains throughout. Being a comedy, it's generally watchable by the entire family as well, with the exception of a lion being hit in the no-nos by a peanut (still, nothing exceptionally detailed) that shouldn't be much of an issue. Being a comedy, especially being based on the stooges three, I really didn't expect much of an elaborate plot-line here - which was both delivered and slightly exceeded. We spend the initial movie getting introduced to the titular characters - Moe (Chris Diamantopoulos), Larry (Sean Hayes), and Curly (Will Sasso) - and the chaos they cause by being themselves. After an introduction, we get a scene that seems only passingly important when Moe gets adopted and then left behind after he says he wants his new parents to bring Larry and Curly with them as his birthday present, but later has more depth added to it. Fast forward a little bit to the main plotline: the stooges embark on a quest to try and save the orphanage at which they have grown up (and incidentally caused to need savings due to insurance issues brought about from the constant "accidents"). What follows this plot establishment is a great deal of classical stooge-ry as the boys go out into the world and try to earn money in any way they can (which normally amounts to something that's rather ridiculous, like a open-range fish farm that really amounts to having a bunch of fish flopping around on a golf course) with plenty of pokes, bumps, and whacks along the way. Eventually, we see the boys split from each other (as is typical of many friendship-themed movies), at which point a slight part of the movie becomes a new plot point - saving their friend who was adopted instead of Moe from what amounts to an assassination plot. Although the sub-plot here is pretty serious, it still remains pretty lighthearted through to it's conclusion, and without giving away too many twists or spoilers the ending is that of a happy one (much as we would all anticipate). Characters here are really secondary to the comedy - Moe for instance is the "leader" type of the silly trio, with depth being added to his character only from the preliminary scene of being adopted just to return, and the others fare a bit worse for wear in the identity department - which isn't to say they don't feel like individuals. The stooges iconic look and attitudes remain intact, and that dynamic shows through in most of the movie. The other characters are almost more there for reasons then they are to be characters - the kids and nuns are there for us to want the stooges to succeed, the sub plot characters there simply to drive that specific plot and help give purpose to the antics of the stooges. "...which always splits my sides ..."
Being a comedy, the lack of character depth really doesn't deter- in fact it keeps the movie feeling a lot more lighthearted, even during the relatively sad parts. 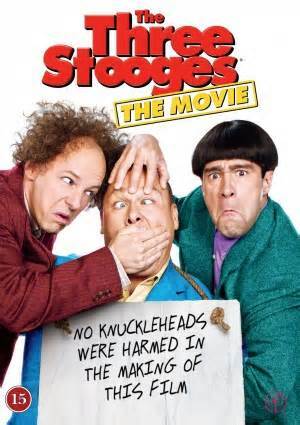 If you aren't a fan of slapstick, or accidental comedies where goofy situations and bad puns occur than more than likely you aren't a fan of the stooges in the first place and should feel a bit "nyuk-nyuk-nyuk" for watching it in the first place. For the rest of us who do enjoy this breed of humor, it's plenty abound, with classic stooge moves like the eye-poke, eye-poke block, and head bonking. The banter is generally witty in the sense of bad puns (Donut remover = Do Not Remove), and they even throw in a small bit of fart humor at the end (which always splits my sides figuratively speaking). They did a good job casting these "replacement" stooges, and personally I feel they really nailed not only the looks, but the actions of the much-beloved older Stooges. Now, set in a modern time there isn't much one can really expect for costumes, although the stooges do have a wide selection (even ranging as far as dressing up as female nurses), but as I always say the uniqueness of the costume set is really limited by that modern setting. The props are quite well done though, to the extent the directors made sure to put a segment before the credits showing that they are fake and letting kids know "You really shouldn't do this at home." The sets are also well done, for things that are modern, and although you can tell that someone didn't go out and seed the golf course with fish, it's believable enough that the idiocy of it is still humorous. Honestly, there isn't a whole lot more I can think to say about this movie. It's funny, if you are into that particular brand of comedy. As a movie, it's entertaining, and as a tribute to the Three Stooges of old, it does a wonderful job of bringing the feeling back. Best bet here is (if you are on the fence about watching it) to watch the trailer, and if you get a chuckle out of it then it might be a good movie for you - otherwise it might not, as the movie is actually more of what you see in the trailer (except that part with the nun coming out of the pool...That must be in an extended edition somewhere).